Kid's Avalache Express - Reg. TWHBEA Tennessee Walking Horse Gelding. Neck reins, canters, SMOOTH riding all the time, never breaks gait under saddle. Reg. Foundation Certified #2,858. ASPC # 154941A. 4 year old Shetland Pony Stallion. Can be used as breeding stallion or gelded and used as children's pet. Winslow has been ridden by a 10 year old and has a very sweet temperament. Reg. 1.5 year old Arabian sabino colt. Lots of type, friendly and flashy, should make a nice show or endurance horse. Very calm and sensible, good sized for a yearling. Easy to train, very calm and fearless. Has already had some professional saddle training. Would make a great police mount or seach and rescue horse. 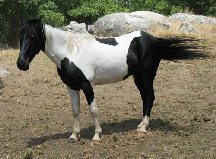 Patches - 11 yr old Pinto mare. 14.2, lots of trail and overnight camping experience, has a gaited walk. Sweet horse needs a loving forever home.